KUALA LUMPUR: Most large corporates are clueless when it comes to innovation and identifying future streams of growth because they are caught up in a certain way of doing things and not able to think outside proverbial box to catch the flicker of change and understand where their respective industries are going and what they should be investing in. Rainmaking Innovation partner Jordan Schlipf, a serial entrepreneur who built his own start-ups and helped many large companies with their innovation initiatives, said in his presentation, entitled: “Creating a robust innovation strategy to navigate uncertainty”, that when it comes to corporate innovation, most large companies get it wrong. Typically, there are no clear strategies and most of the time, the investments made do not deliver any real commercial value. 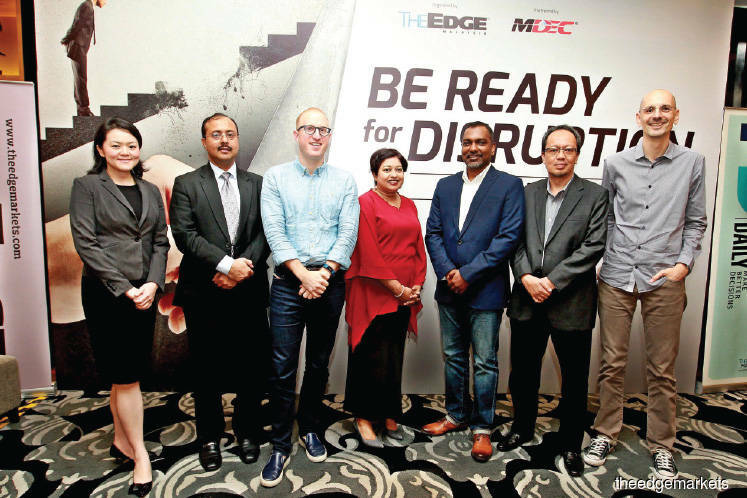 He was speaking at The Edge-MDEC CEO Forum, “Be ready for disruption”, an exclusive forum for chief executive officers (CEOs) and other members of the C-suite in Kuala Lumpur yesterday. “When it comes to the need to innovate, the corporate’s first response is to create a corporate venture capital fund, parking about US$50 million (RM209.5 million) to US$100 million there, and consider that the problem is solved. “If not, they will take to acquiring innovative start-ups. We have seen waves in the Silicon Valley where these corporates act like little kids in a candy store with their father’s credit cards, buying all the technology businesses. The results have been pretty terrible, with nosebleed valuations,” he said. Schlipf was similarly dismissive of the other usual ways of sourcing ideas such as hackathons, accelerators, incubators and innovation garages. These are fine by themselves, but most do not produce the required results, considering the size of the investments. The problem, he added, is that there are no communicated sets of best practices of what works in terms of creating a robust innovation strategy and no reputable models that can be deployed to generate the results. During a panel discussion later, Schlipf underlined the importance of actually changing the corporate culture to make room for innovation, rather than just paying lip service to the concept. “The problem more often than not is they’re not actually changing the levers. “They want culture change without changing KPIs (key performance indicators); they want culture change without changing processes; they want culture change without changing the structure. That’s not going to work,” Schlipf says. Three of the VIP members were also present at the panel discussion — Malaysia Airlines Bhd’s head of digital Peter Pohlschmidt, Gamuda Bhd information services manager Ng Lu Ling and KPJ Healthcare Bhd new product and services head Dr Mubbashir Iftikhar. The other two VIP members are Digi-X, the innovation arm of telecommunications company Digi Telecommunications Sdn Bhd and IJM Bhd. During the panel discussion, Pohlschmidt said Malaysia Airlines is looking at ways to provide its customers innovative solutions and services. These include doing things such as utilising customers’ purchasing history to offer them products and packages that best suit their demand. Meanwhile, Gamuda’s Lu Ling said the company is exploring new ideas such as providing homebuyers property via a monthly subscription fee and renting out its heavy machinery which sits idle for a greater portion of the time, to enhance earnings. MDEC chief operating officer Datuk Ng Wan Peng, said in her opening remarks that by 2027, 50% of the market of non-digital companies will be taken over by thousands of start-ups with digital businesses. By the end of 2016, the digital economy already contributed 18.2% to national gross domestic product (GDP), which was the original target for 2020. “The new target for 2020 is 20% of GDP. “Based on our work with McKinsey’s, the estimate of the increase of economic impact is RM40 billion by 2025 if all of us adopt and embrace technology and do something about it,” she says. This is the second The Edge-MDEC CEO Forum. Last year, the forum, which was also held in November and entitled: “Disrupt or be disrupted”, saw the launch of the Value Innovation Platform to provide corporations with a structured approach to digital innovation. This year, attendees were given a brief taster of the process they would be put through, should they decide to get on board. As Schlipf was quick to point out, there is no magic bullet or quick fix solution. It would firstly to locate yourself and your business through the use of an innovation compass, then decide where your future growth opportunities are so you know where to concentrate your attention. This, as The Edge Financial Daily editor-in-chief Azam Aris emphasised in his opening speech, was an important message to corporations caught off guard by the rapid changes in the market.